Our Lord said where two or three are gathered, there he is. 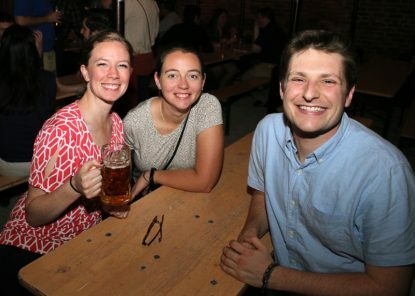 He must have really been there on Friday night, Oct. 6 when 300 young adults showed up to Anthem’s Oktoberfest event at Frankford Hall, a hotspot in the Fishtown neighborhood of Philadelphia. Lest you imagine this was just another (or a bigger) Theology on Tap, the director of Anthem (the rebranded Office of Youth and Young Adults for the Archdiocese of Philadelphia), Jacob King, is quick to point out the differences. And indeed it was. Aside from Archbishop Charles Chaput leading grace, the Oktoberfest was unique in that it was a genuinely social event for the city’s young Catholics, rather than an “after party” to a worship- or instruction-focused event. “My role here is just to say grace,” said the archbishop. “We pray that we turn our hearts and minds toward you, O God, and that everyone has a good time tonight. “And also that we do not drink too much,” he added. The private ticketed event for those over 21 that included priests, seminarians and religious — even three of the archdiocese’s four auxiliary bishops — sold out at its initial cap of 250. But sales were expanded at the last minute and 50 more tickets quickly were snatched up. Frankford Hall is a Stephen Starr restaurant at 1210 Frankford Avenue, a traditional, open-air German biergarten that it is extremely popular with Philadelphia’s young adults. This “soft sell” approach to religion was something affirmed by Anthem’s whole team, whose three members have been brainstorming new events and approaches to their particular demographic since the office officially opened in 2016. Prior to King’s arrival, ministry to youth and young adults fell under the Office for Catechetical Formation, which handles parish RCIA and PREP programs. Live entertainment featured local polka sensation Polkadelphia, which describes itself as “not your ordinary oompah band” (their set list includes polka-stylized covers of pop and rock classics), and a later lineup of solo performers. 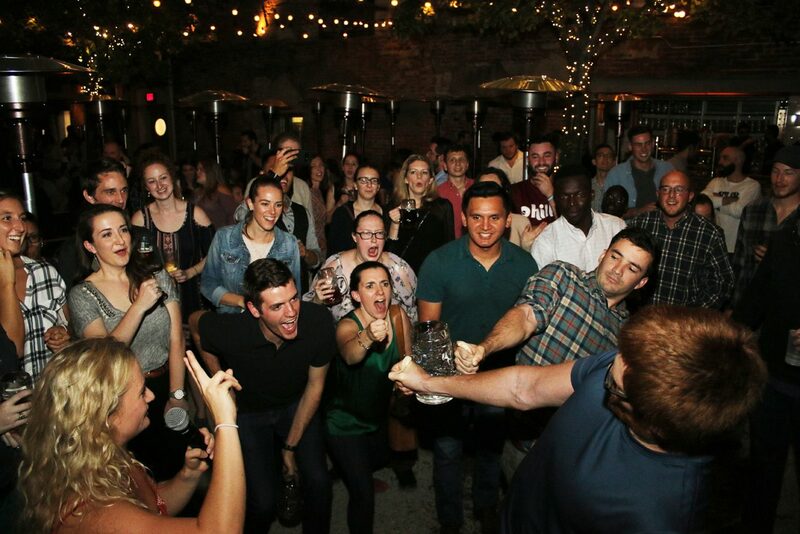 The Frankford Hall event was a social preview to Sunday’s “Queen Takeover,” Anthem’s official Mass consecrating the young adults of Philadelphia (and the city itself) to the Blessed Mother. King said Anthem has a number of volunteer opportunities in the works with Catholic Social Services, most of which focus on serving Philadelphia’s homeless and underprivileged. Loved this! More get-togethers needed! !